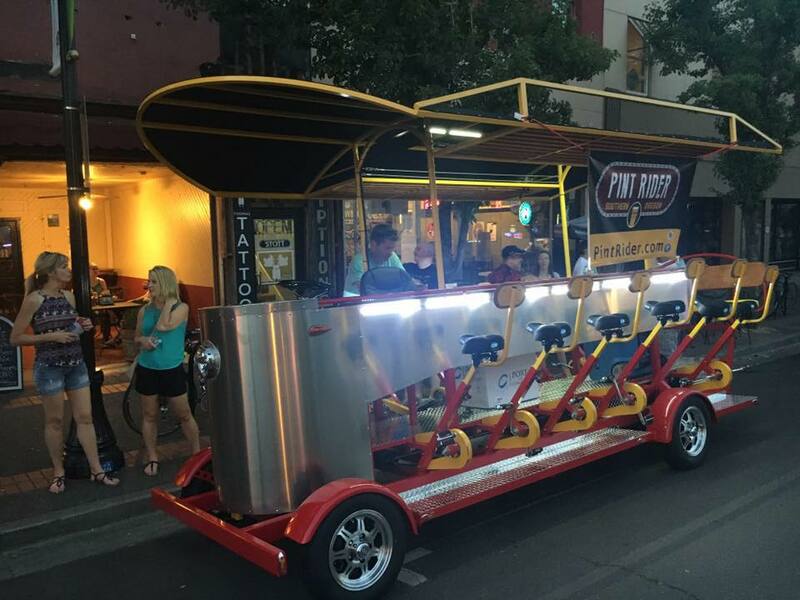 The Pint Rider, is a group-oriented rental amusement activity, similar to a Party Bus, that looks like a trolley you pedal. Unlike a Party Bus, though, the Pint Rider is entirely pedal-powered and is often called a Party Bike. Based in Medford, Oregon, our multi person bike holds up to 15 party goers, (that’s 12 seated along the sides and up-to three on the rear bench). Physically, its about the size of a cargo van and travels at average speeds of between 5 and 8 miles per hour. The Pint Rider is currently available for rent in the downtown Medford area, but we’re currently exploring other areas in Southern Oregon. The Pint Rider is rented on a 2.5-hour basis like any other party bus or other special event rental vehicles; How the rental time is spent is up to the renter. Generally the Pint Rider is used as a safe, fun way to do a pub crawl/bar crawl or progressive dinner, but does not, necessarily, require stopping during the rental period. 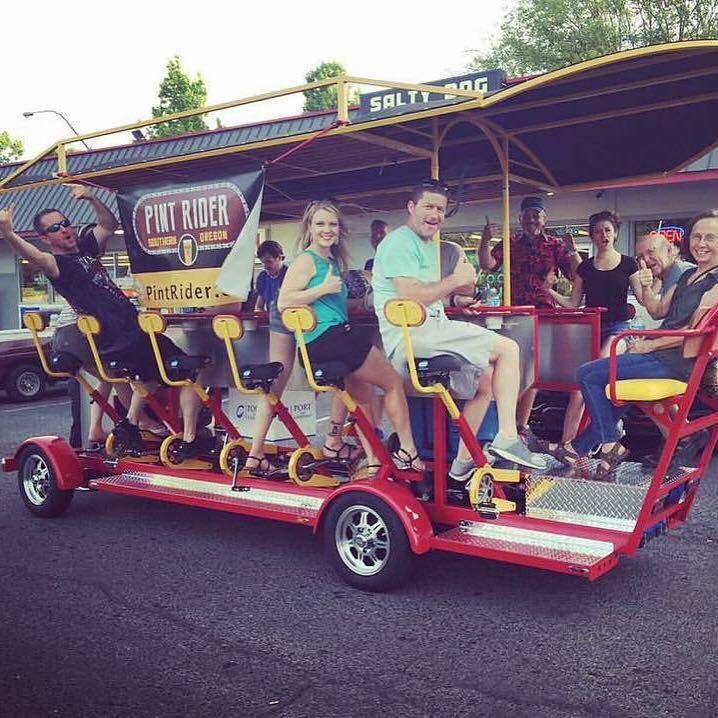 People often rent the Pint Rider for events such as Bachelor Parties, Bachelorette Parties, Team Building events, corporate events, Birthday Parties, company parties, tailgating, cyclist group events, parades, conventions and more. Availability & Rates for the Pedal Party can be found on our book now. In the spring and fall, availability of our Pint Rider will become tighter, so remember to book early for your graduation party, bachelor/bachelorette party, anniversary or other special event. Generally its good to make your reservations no less than two weeks in advance to assure you get the day and time you want.